There are components called differentials in every car. These differentials are connected to your wheels and drive shaft. Front-wheel drive cars have front differentials which rotate the two front wheels. Four-wheel drive cars have front differentials to move the two front wheels and rear differentials to move the two back wheels. When engine power is generated from the internal combustion process, it is transferred to the transmission. From there, the driveshaft rotates which delivers power to the differentials so that they can rotate the wheels. If any of these components were to fail or get damaged, it will disrupt the vehicle’s movement. Every one of these components works together to make car movement possible. The drive shaft is one of the first components of this system to have problems or malfunction. The early warning signs of a bad drive shaft will be when it makes strange noises. There may be small parts of the drive shaft which need to be repaired or replaced when these noises occur. It doesn’t always mean you need to replace the entire drive shaft. You will learn why as you learn more about the different causes of drive shaft noises. Below are the top 5 causes of drive shaft noise in your car. 1) Bad Tube – In the middle of the driveshaft is a little tube. As you drive the vehicle, the tube spins around. There is a maximum load capacity which most vehicles have because of their drive shaft. If you were to exceed this capacity while your vehicle is in motion, then you will find that your drive shaft will make strange noises. These noises come from the spinning tube which is now damaged or malfunctioned because of the extra weight. Even if you lighten your load the next time around, you will still need to have a mechanic inspect your drive shaft and possibly replace the entire thing. 2) Bad Bearings – The driveshaft has rubber bearings which keep it attached to the vehicle. They also sustain the functionality of the driveshaft. If the bearings were to go bad or get damaged in some way, the drive shaft will start acting strangely. One of the first things you will notice is strange noises coming from it. If the problem isn’t addressed quickly, there may be vibrations which follow the noises. 3) Bad U-Joints – U-joints are universal joints which keep the rods and axes attached underneath your vehicle. For your differentials and drive shaft to rotate, the U-joints must be in great condition. However, it is common for U-joints to get worn out as time goes on. If they fail, it will cause your drive shaft to make weird scraping and rattling sounds underneath your vehicle. 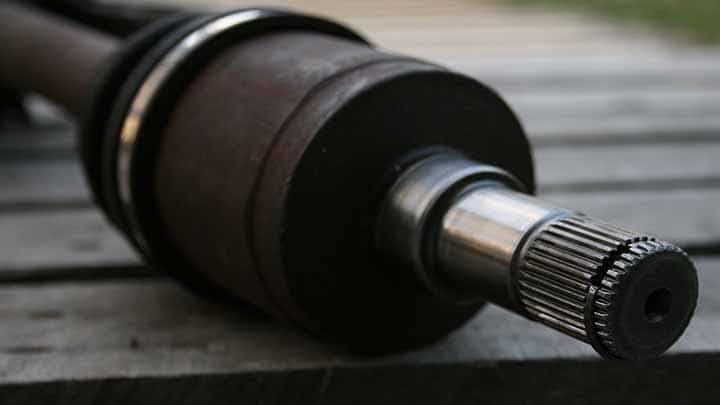 4) Loose Drive Shaft – Sometimes the entire drive shaft itself will become loose if the U-joints and bearings are damaged or worn out. Once you have a loose drive shaft, the entire device will be dislocated and will make very loud noises beneath the vehicle. The noises will get even louder as you accelerate the vehicle, especially if you’re driving over uneven terrain where there’re a lot of bumps on the road. 5) Bad Bushings – The bushings are just as important to the drive shaft as the bearings. They help give support to the drive shaft so that it can stay connected and do its job. If the bushings were to go bad because of old age and wear and tear, then they will cause the drive shaft to make noises and possibly vibrate too. You can easily and affordably have these bushings replaced by a mechanic.